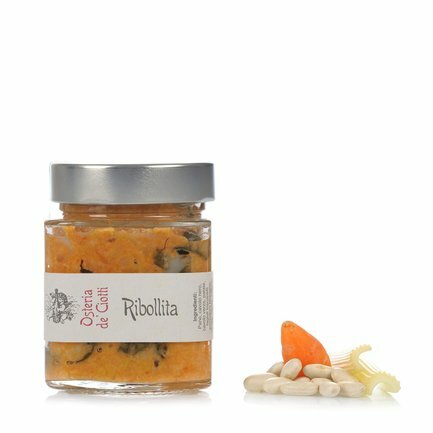 The ribollita is one of those recipes that most worthily represents the essence of the Tuscan gastronomic tradition. The Osteria de Ciotti makes it faithfully according to the recipe, exalting the flavour by using excellent ingredients: bread (the famous "bozza" from Prato), Toscanelli beams from Mario Agostinelli, local vegetables and tomatoes from Apuglia. To best enjoy the ribollita, heat it with a bit of water until a thin crust forms. Serve it hot with a few drops of extra virgin olive oil and a dash of pepper. Ingredients Organic tomato, onions, celery, carrots, potatoes, black cabbage, savoy cabbage, beans, extra virgin olive oil, chilli pepper, sage, garlic, salt and pepper. Allergens: celery and celery-based products. For more information on product labels, please contact our Customer Service department. The information on the labels of the products may vary for reasons beyond our control, therefore, there may be discrepancies between the information on the site and that on the products delivered. Please always check the information on the product before consumption or use. The Osteria de Ciotti line was created out of the passion and fantasy of Cristina Pagliai and her husband Fabio Goti, who created the company Nunquam together in Tavola (PO). All the products the couple makes are an expression of an enogastronomic project that started in 1999, which has been extended and enriched over the years. The Osteria de Ciotti line, in particular, proposes the most typical regional recipes, made using highly selected ingredients and conserved in glass jars in order to preserve the flavour, in accordance with the conservation methods of long ago.